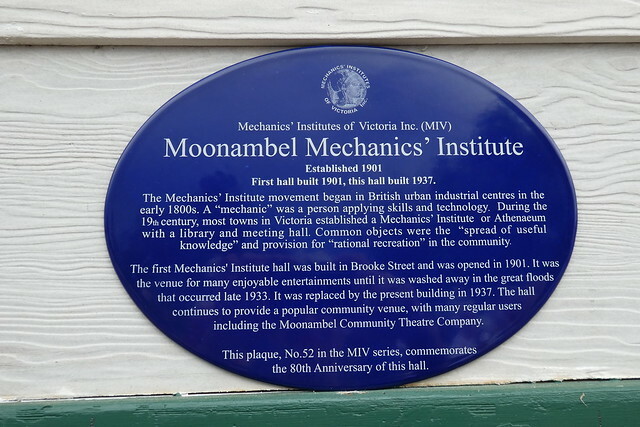 Moonambel Mechanics' Institute. Established 1901. First hall built 1901, this hall built 1937. The Mechanics' Institute movement began in British urban industrial centres in the early 1800s. A "mechanic" was a person applying skills and technology. During the 19th century, most towns in Victoria established a Mechanics' Institute or Athenaeum with a library and meeting hall. Common objects were the "spread of useful knowledge" and provision for "rational recreation" in the community. The first Mechanics' Institute hall was built in Brooke Street and was opened in 1901. It was the venue for many enjoyable entertainments until it was washed away in the great floods that occurred late 1933. It was replaced by the present building in 1937. The hall continues to provide a popular community venue, with many regular users including the Moonambel Community Theatre Company. This plaque, No. 52 in the MIV series, commemorates the 80th Anniversary of this hall.